HMS Dragon has returned to Portsmouth after a seven month deployment in the Middle East. The type 45 destroyer has been making history since leaving the city on September 17, pulling off eight drug successful raids on drug smugglers and seizing £200m worth of narcotics. 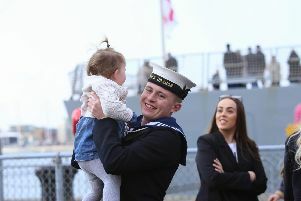 She was greeted by hundreds young and old as she arrived back in Portsmouth this morning. Horndean resident Michelle Brett, 51, was waiting for her husband Stuart, Chief Petty Officer, to arrive home. She said: 'We have been together for years so you get used to them being away as a navy wife. 'He has been on her for two years. 'We are going on holiday in a week's time. We always plan a trip away for as soon as he gets back so that we can reconnect. 'We are going to the Dominican Republic. HMS Dragon has been deployed to the Arabian Gulf and the Indian Ocean for the last seven months as part of Operation Kipion. The record eight drug busts her crew pulled off during the deployment saw her rake in more drugs in seven months than the UK’s police force has in a year. Gaye Campbell, 75, from Seaford, Sussex, was waiting for her grandson Ryan Marsden, 21, to return from his first deployment. She said: ‘It has been very busy. 'It has been strange having him away. I have watched him since he joined up in Plymouth and then through all his training. 'We popped out to Dubai to see him over New Years. 'He is looking forward to going to watch Brighton play Bournemouth away tomorrow. We are a footballing family. 'I have been keeping in touch by messenger. 'You have got to give credit to the whole crew for the drug busts. 'I think the Royal Navy are very good on the family side. 'His main priority is seeing the season through, they are in a relegation battle. He is planning on going to away games as well as home ones.